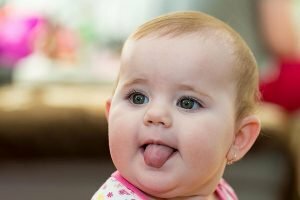 Ankylogossia, commonly known as tongue-tie, is a condition in which the thin piece of skin under a baby’s tongue is shorter than usual, causing restricted movement of the tongue. It is estimated that around 2 to 11 per cent of babies may be affected by ankylogossia, and the exact reason the condition occurs is largely unknown. Tongue-tie appears to run in families and commonly affects boys more than girls. At Bondi Dental, we can easily and effectively treat lip and tongue-tie condition using soft tissue laser therapy. The cause of tongue-tie is unknown. It is still unclear whether or not tongue-tie is inherited, although some cases have been linked to certain genetic factors. Tongue-tie is said to have two main causes. Typically, the frenum (which is a band of tissue that connects the tongue to the bottom of the mouth) separates before birth, which allows the tongue free range of motion. With ankylogossia, the frenum becomes too short and tight during development and remains attached to the bottom of the tongue. The other cause is the heart-shaped tongue tip, which is one of the obvious symptoms of the condition. Frenulotomy, also referred to as frenulectomy or frenotomy, is a procedure that removes the frenulum, which normally prevents an organ in the body from moving too far. If left untreated, tongue-tie can negatively affect the tooth alignment and speech of a baby. Fortunately, this can be corrected with the frenulotomy procedure. Your Bondi Dental dentist employs the less invasive approach of soft tissue laser therapy when performing a frenulotomy. At Bondi Dental, we have knowldege and skill in laser frenectomies and we perform the lip and tongue-tie treatment for babies so we can help you and your baby develop a healthy breastfeeding relationship. We see newborn babies 1 day to 10 months old, in the presence of an IBCLC lactation consultant. An International Board Certified Lactation Consultant (IBCLC) is a healthcare professional who specialises in the clinical management of breastfeeding. We follow all appropriate safety precautions and ensure that your baby is very safe and gets the top-notch treatment they deserve. Bondi Dental is a reputable, well-regarded practice located in Bondi Beach, Sydney, offering high quality services to the local Bondi community, the Eastern Suburbs, Sydney, and its surrounding areas. Call us on (02) 9365 7187 to schedule your Lip and Tongue-tie consultation at Bondi Dental.